If you're looking for real, terrific Indonesian food, head to Simpang Asia. 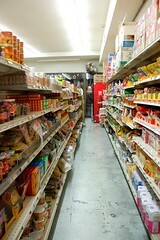 You can pick up Asian groceries while you're there. 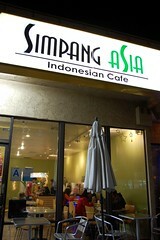 Native Indonesians and friends who have lived in Indonesia have told me that Simpang Asia's offerings are authentic. I don't have much experience with Indonesian food, but I can tell you that everything I ate made me pretty happy. 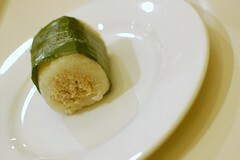 Lemper -- banana leaf-wrapped sticky rice and chicken. 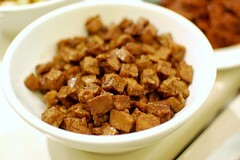 Tahu tempeh -- deep-fried tofu and tempeh ($4.00). Nasi bungkus -- banana leaf rice wrap with chicken curry, beef rendang, Balinese-style egg, spiced potato, bits of chicken gizzard, and vegetable curry ($7.50). 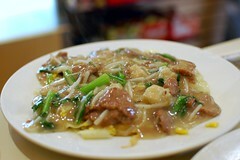 Kwe tiau goreng sapi -- stir-fried flat rice noodle with beef, bean sprouts, and yu choy ($6.75). 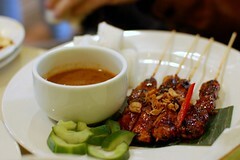 Chicken satay ($4.50). 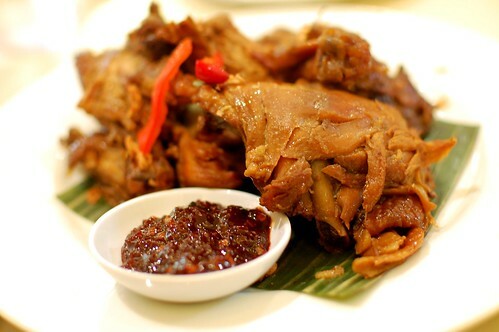 Ayam kalasan -- fried chicken sweetened with coconut ($7.50). 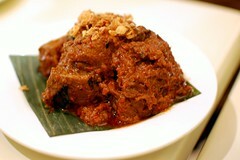 Rendang -- tender dried beef curry ($5.50). 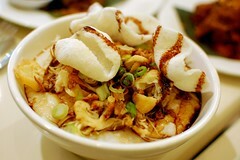 Bubur ayam -- rice porridge with chunks of turmeric-spiced chicken, Chinese doughnut, and onion chips ($5.50). i live near simpang and always been on my list to try... i DEFINITELY need to hit it up now! stumbled across your blog today-- good stuff here! 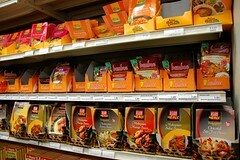 i remember in 2009 i drove to Simpang Asia from downtown as i heard they sell prima-taste packs. not sure if you're familiar with them, but they are some of the best boxed flavoring packs around. at least they're the only ones i don't mind using. outside of raw produce, starches, etc, the packs give you everything you need to make dishes (usually in paste, powder, or liquid form). but of course i still sat down in the adjacent cafe and got some ayam kalasan and nasi goreng. Looks delicious. 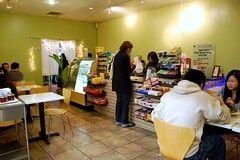 Your blog always makes me jealous that my food options are so limited here. We've only eaten there once, but we really liked it. Excited to go back again soon! dude. 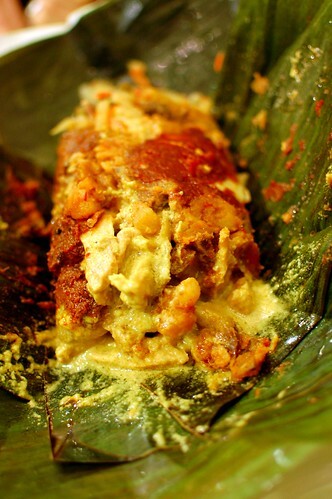 the banana leaf thing and rendang look so good. I thought the first thing said leper. Yum yum yum! Love the sticky rice with chicken dish!